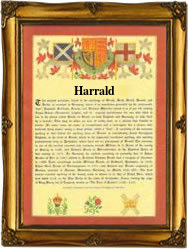 This interesting surname is derived from the personal name Harold, itself coming from the Anglo-Saxon "Here-weald" meaning "army power". Harold was a popular Scandinavian personal name for example Harold Harefoot was the second Danish King, Succeeding Canute in 1035, and Harold 11, the last Saxon King Killed at Hastings in 1066, was partly of Danish blood. The surname dates back to the late 12th Century, (see below). Further recordings include one Radulfus Harold (1196) witness, "The Feet of Fines, Yorkshire", and Philip Herald (1327) "The Subsidy Rolls of Sussex". Variations in the idiom of the spelling include Harroll, Harrold, Harrel, Harrad, Harrod etc.. One Syble Harrolde was christened at St. Mary Magdalene, Old Fish St., London, on April 14th 1550, and William Harrold was christened on March 22nd 1577 at St. Mary Whitechapel, Stepney. Edward Harrold married Mary Browne on January 26th 1691, at St. James, Dukes Place, London. The first recorded spelling of the family name is shown to be that of Ralph Harold, which was dated 1171, "The Pipe Rolls of Yorkshire", during the reign of King Henry 11, "The Builder of Churches", 1154 - 1189. Surnames became necessary when governments introduced personal taxation. In England this was known as Poll Tax. Throughout the centuries, surnames in every country have continued to "develop" often leading to astonishing variants of the original spelling.